Praetor Neral presides over the Continuing Committee of the Romulan People, the final authority on Romulus. Requires: Romulus, any Neral, Intelligance - Tal Shiar. This Card-Review article was written by Kathy McCracken and was published first on "Major Rakals Tal Shiar Headquarters (members.cox.net/majorrakal)" at Jan 22nd, 2000. Previous "Romulan Review" (# 91): "RR #91: Kukalaka". Next "Romulan Review" (# 93): "RR #93: Sela". The first unusual feature of this headquarters is that, unlike all the others, it does not allow free play of HQ cards. No matter, because its second unusual feature allows it to share the homeworld with the Office of the Proconsul, directly overriding the normal rule that you can't establish more than one facility at a location. So if HQ card plays are important to your strategy, you can still get those free plays by using both headquarters. Either headquarters will allow all your Romulan-compatible personnel and ships to report (ships in orbit). Koval (V.I.P. : SECURITY, Treachery, Tal Shiar x2 (when )., Exobiology, Your Tal Shiar may report here. 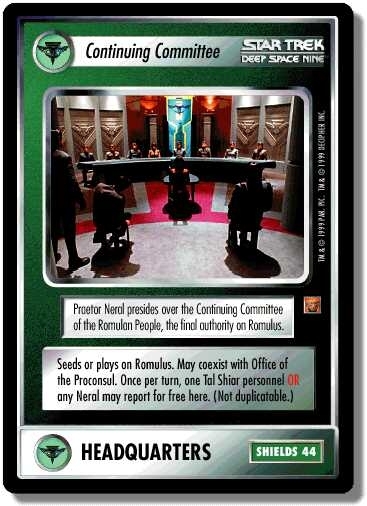 The weakest card is Neral, who can also report to the Office of the Proconsul. (Hopefully, "any Neral" is an indication that we'll eventually get another version of the Neral persona in the guise of Praetor Neral.) The rest... well, what can I say--they're Tal Shiar! They have six of the seven personnel types, lacking only CIVILIAN, plus lots of desirable skills like Exobiology, Biology, Diplomacy, Empathy, Navigation and Computer Skill, and even the very rare Law skill. Most have either a command star or staff star; over half have Treachery. Almost any Romulan deck can use several, so the ability to report them for free is a big plus. Is it worthwhile to have two headquarters? As with all such choices, a lot depends on your specific strategy. But the Tal Shiar include some of the most powerful Romulan personnel, and while the free reports to the Office of the Proconsul are not as generally useful, they do include three OFFICERs to complement the overwhelming number of V.I.P. Tal Shiar, as well as three Diplomats (in addition to Vreenak who can report either place). With both headquarters and some form of extra card-drawing ability, you can easily report three personnel per turn. Tal Shiar skill used to have a "built-in" function. What was that function, in which expansion set was it introduced and in which expansion set did it disappear? In the Q-Continuum expansion, Tal Shiar skill allowed Romulans to initiate battle against other Romulans; if no other leader was present, the Tal Shiar personnel could act as a leader for battle. This built-in function was rescinded in the Deep Space Nine expansion, replaced by HQ: Defensive Measures which provided a similar function for all the "intelligence" skills. Continuing Committee + Office of the Proconsul + HQ: Secure Homeworld: The HQ card itself and all the skills you need to solve the mission can play for free at the two headquarters. Add a play-for-free HQ: War Room to make the single-attribute total > 30 almost trivial. Continuing Committee + Koval: Once you report Tal Shiar chairman Koval for free to the Continuing Committee, take your pick for future Tal Shiar reports - to the headquarters for free or "in the field" to Koval using your card play.